Chief Election Commissioner T.S. Krishna Murthy’s last day in office on Sunday. 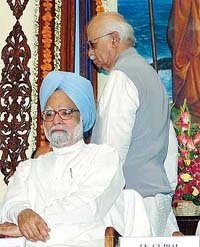 Prime Minister Manmohan Singh and former Deputy Prime Minister L.K. Advani during a special memorial meeting to pay tributes to Swami Ranganathananda Maharaj, chief of the Ramakrishna Mission, in New Delhi on Sunday. The Supreme Court, which had dismissed a petition challenging induction of “tainted” minister in the UPA government earlier this year, has issued notices to the Centre and the Election Commission on a petition challenging the validity of the Section 8(4) of the Representation of People Act allowing a convicted MP or MLA to continue in office during the pendency of his appeal in the higher courts. Union Parliamentary Affairs Minister Ghulam Nabi Azad yesterday termed the NDA boycott of Parliament "sad and unfortunate" and appealed to the Opposition to return to both the Houses in Monsoon session and participate in parliamentary committees during the inter-session period. Prime Minister Manmohan Singh will visit Sariska tiger sanctuary on May 23 to hold discussions with officials over reports of disappearance of tigers, PM’s Media Adviser Sanjay Baru said today. The Prime Minister will stay in the sanctuary for one night and two days. It may be recalled that the PM had constituted a five-member task force to go into the reports of fast-decreasing population of tigers. The Ministry of Home Affairs has put on hold Overseas Indian Citizenship, also known as Dual Citizenship. This is because the ministry is in the midst of revising the procedure for the registration of overseas citizenship. This exercise will take a few months to be completed. 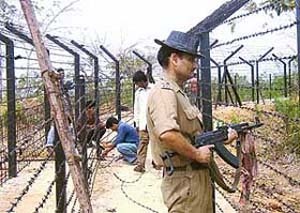 Vigil on the border continues as labourers raise the barbed-wire fence along the 856-km Indo-Bangladesh border with Tripura on Sunday. 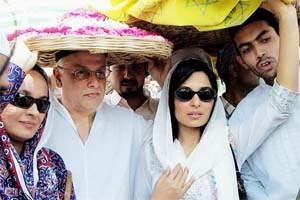 Pakistani filmstar Meera Rabab (second from right) accompanied by producer Mahesh Bhatt and director Soni Razdan (left) of the film "Nazar" offering chaddar at Khawaja Moinuddin Chisti's dargah in Ajmer on Sunday. 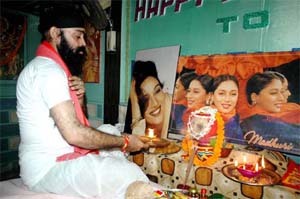 Pappu Sardar, a die-hard fan of Bollywood actress Madhuri Dixit, performs pooja on the occasion of Madhuri's 38th birthday at his shop in Sakchi, Jamshedpur, on Sunday. Students of BVB College of Hubli display their device at an exhibition in Hubli on Saturday. 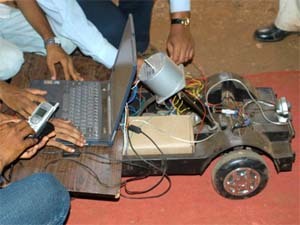 The students claim that the device can control the movement of a car anywhere in the world using the Internet. Bahujan Samaj Party chief Mayawati was today authorised by the party’s central executive committee and state presidents to take a decision at an “appropriate” time on withdrawal of support to the UPA government. With the “favourable Congress government” at the Centre, the responsibility of organising functions at birth and death anniversaries at samadhis of important political personalities in Delhi, other than that of Mahtama Gandhi, like Jawaharlal Nehru, Rajiv Gandhi, Indira Gandhi and Chowdhry Charan Singh, is back with the Union Ministry of Urban Development. To sensitise elected representatives from Parliament to panchayats on issues concerning population and development, the Indian Association of Parliament on Population and Development has developed a briefing kit which gives nuggets of information. Principal of the Kendriya Vidyalaya, Khargone, who had accused the Collector of sexually harassing her, has moved the Central Administrative Tribunal against her transfer to Bailadila in Bastar district of Chhattisgarh. Mahipal Singh, the actor who made immortal the angst of a creative mind caught in the world of fantasy and his obsession with his muse in the V. Shantaram classic ‘Navrang’, was one whose journey from Jodhpur to Mumbai was marked by a poetic struggle. A three-member Bench comprising Mr Justice Ram Nandan Prasad, Mr Justice Barin Ghosh and Mr Justice M.L. Visa has been constituted for day-to-day hearing from tomorrow on RJD president Lalu Prasad and former Chief Minister Rabri Devi’s petition challenging sanction for their prosecution in disproportionate assets case, an offshoot of fodder scam. The Shiv Sena in Maharashtra has decided to go shrill on Hindutva by organising a nine-day long Savarkar Utsav in Mumbai. The utsav will be held to commemorate the 122nd birth anniversary of the right-wing Hindu leader. “We have to educate youth about Savarkar,” Shiv Sena spokesman Subash Desai said yesterday. Children vaccinated on Pulse Polio Day. A superstore in Hyderabad comes up with organic food to cater to health freaks. India makes a mark in Hollywood by manufacturing merchandise for blockbusters. The allegations made by IAS officer L. V. Sapthrishi were an effort to denigrate the Commission, said the Chief Election Commissioner T. S. Krishna Murthy hours before demitting office. “I felt it was sad. It was unfortunate such things should have happened. My own inference is it was an attempt to denigrate the Election Commission so that its authority gets weakened,” he said, adding that fortunately the reaction from every responsible quarter to the controversy was in favour of the Commission. During his tenure as CEC, Mr Krishna Murthy pointed out there were attempts by political parties to criticise commission decisions. “Unfortunately, no political party likes to be disciplined, especially when the commission has to enforce rules and regulations strictly,” he said. Emphasising the need to push through electoral reforms, he said Prime Minister had promised to look into the 22-point charter to reform the system when he met him last week. “I know considerable time has been lost and I understand the pressures of coalition politics,” he said. He felt there could be a “movement forward” and more transparency in the electoral system if some of the recommendations like disqualification of candidates with a criminal background, regulation of political advertisements during elections and right of electors to cast a negative vote were implemented. He also emphasised the need for giving legislative backing to the model code of conduct to punish the violators. The seniormost Election Commissioner, Mr B. B. Tandon, who succeeds Mr Krishna Murthy, will take charge on Monday. Notices were issued to the Uttar Pradesh Government and the Principal Secretary of the Uttar Pradesh Vidhan Sabha as the petitioner, had cited some instances of convicted MLAs continuing in the state Assembly. A public interest litigation (PIL), filed by an association of retired government officers, Lok Prahari, said the protection granted under Section 8(4) to the legislator against immediate disqualification after conviction in a criminal case, defeated the other provisions of the same section, where a person awarded sentence more than two years becomes automatically disqualified for contesting elections for six years. Seeking quashing of sub-section 4 of the Section 8, the PIL said this provision violated the Articles 102 and 191 of the Constitution laying down various disqualifications of MPs and MLAs. Besides, the sub-section was also hit by the provisions of the Article 14, in which certain limitations had been spelt out about the equality before the law, the PIL said. However, the court during a brief hearing said its Constitution Bench had recently passed a judgement in a Haryana MLA’s case on the question of protection against disqualification. The judgment had clarified that after conviction and his appeal being admitted by the higher court, the protection was only limited to the longivity of the current House, the Bench said. 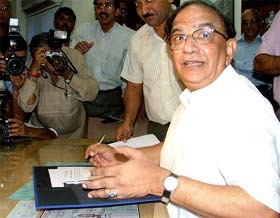 When Lok Prahari’s General Secretary Satya Narain Shukla, arguing the matter personally, said the law was that a legislator who had been sentenced to more than two years imprisonment was not qualified to become an MP or MLA, but sub-Section 4 of the Section 8 of the RPA provides him protection against such disqualification if he was convicted after his election and he still continued to be a member of the House till final decision on his appeal in the highest court. Mr Azad, while appealing to the Opposition to end the boycott, also sought to turn the tables on the BJP-led NDA on the issue of "tainted" ministers saying the UPA was merely following the precedent set by them. On the 'tainted' ministers' issue, he said there was no question of action by the government in the matter as it was following the precedent of then Prime Minister Atal Bihari Vajpayee who had held that whom to appoint a minister was the prerogative of the Prime Minister. Besides, the NDA had also argued that no one could be held guilty unless convicted by court, Mr Azad said stressing that the UPA was now following the footsteps of the NDA. He said earlier the Congress used to act swiftly against party ministers or chief ministers after any court stricture was passed against them. Mr Azad urged the Opposition to take part in the proceedings of various parliamentary, standing and consultative committees during the inter-session period and in the monsoon session of Parliament. To a question, he said while the Phukan Commission report on Tehelka expose had been tabled in both the Houses of Parliament, the Government had no intention to table the concerned CVC report. He said the Leader of the House and Defence Minister, Mr Pranab Mukherjee, had told the Leader of the Opposition, Mr L K Advani, in the Lok Sabha itself that when NDA government did not do so, they should not expect it of the UPA government. "The matter ended there," he said. He said the just-concluded budget session saw transaction of financial business relating to Railways and General Budget and passage of 26 Bills by both the Houses, including the Patents (Amendment) Bill, Money Laundering (Amendment) Bill, Right to Information Bill and Special Economic Zones Bill. The Ministry of Home Affairs has put on hold Overseas Indian Citizenship (OIC), also known as Dual Citizenship. This is because the ministry is in the midst of revising the procedure for the registration of overseas citizenship. This exercise will take a few months to be completed. In view of this, the ministry has temporarily put on hold the dual citizenship process till the revised process is sent for implementation to more than 150 diplomatic missions India and abroad. The Ministry of Overseas Indian Affairs is in touch with the Ministries of Home and External Affairs and the Indian missions abroad to clarify and coordinate matters. The ministry had circulated a draft Cabinet note containing proposals to amend the Citizenship Act, 1955 and is awaiting clearance of the Ministry of Law and Justice to bring the matter before the Cabinet. Revised rules incorporating simplified application form/procedures are at this stage being cleared by the Ministry of Law and Justice and would shortly be notified. Pending this, acceptance of applications and registration of Overseas Indian Citizenship has been put on hold. The process would start again once new rules are notified and also put on their website. Prime Minister Manmohan Singh had made certain important announcements regarding Overseas Indian Citizenship at Pravasi Bharatiya Divas 2005 on January 7 in Mumbai. The Prime Minister’s announcements had following four components: (1) Overseas Indian Citizenship would not be restricted to 16 countries but made available to overseas Indians in any country whose laws permit dual citizenship. (2) The application forms and procedures would be simplified. (3) Various options regarding the document of Overseas Indian Citizenship, including a smart card, would be considered. (4) The benefits of Overseas Indian Citizenship would be clearly spelt out. On the Prime Minister’s suggestion the ministry is exploring a better option: a registration certificate printed on security paper. This would be used along with a visa sticker that would enable the Overseas Indian Citizenship to travel to India without applying for a visa each time. Other options could be considered later. The Ministry of Overseas Indian Affairs’ Secretary told the Standing Committee on External Affairs, which presented its report to the Lok Sabha three weeks ago, that a new category of citizenship has been created — Overseas Citizen of India— which would be through a process of registration. By June or July, this process would initially start in 16 countries where it has already been notified. The government is going to amend the existing laws to enlarge the scope beyond these 16 countries. The ministry is currently working on simplification of a host of rules which were cumbersome. For example, the application forms for Overseas Indian Citizenship were lengthy and asked the applicant to disclose a lot of personal details. These application forms had to submitted to Indian missions overseas, which, in turn, had to be transmitted to New Delhi for sanction. Now, powers will be delegated to Indian consulates abroad to sanction the applications and in the next three months or so, the Overseas Indian Citizenship facility will start in 16 countries already short listed. As a result, whosoever is living these 16 countries, if eligible, can apply and within two weeks his application would be considered and he will be granted registration. The Ministry of Overseas Indian Affairs, in its agenda for action under ‘Diaspora Services’, is also considering extending new benefits like voting rights to Overseas Indian Citizens. This was stated by Ms Mayawati after a meeting of the party’s National Executive. After the meeting, she told reporters that she would take a right decision at the right time on the question of support withdrawal. The BSP National Executive meet condemned the filing of an FIR by the CBI against Ms Mayawati in the Taj corridor case. Ms Mayawati had yesterday made an appearance in the Rajya Sabha after a long gap and put the UPA government in the dock over her recent questioning by the CBI in a disproportionate assets case. A livid Ms Mayawati today said the Dalit community was furious by “double standards” adopted by the CBI in her case and the party’s state unit leaders had sought her permission to launch a nationwide agitation on the issue. Ms Mayawati said she would write to Prime Minister Manmohan Singh and UPA Chairperson Sonia Gandhi seeking to know the steps taken by the Centre to protect the interests of Dalits. Asked about the possibility of BSP withdrawing support to the UPA government before the government completes one year in office on May 22, Ms Mayawati said she would wait for the response from the two leaders. With the “favourable Congress government” at the Centre, the responsibility of organising functions at birth and death anniversaries at samadhis of important political personalities in Delhi, other than that of Mahtama Gandhi, like Jawaharlal Nehru, Rajiv Gandhi, Indira Gandhi and Chowdhry Charan Singh, is back with the Union Ministry of Urban Development. For the past six years, the Delhi PWD had been holding such functions. The ministry, following a meeting held on May 7, is busy preparing for the functions to be held at Vir Bhumi, the samadhi of Rajiv Gandhi, on May 21, Shanti Van, the samadhi of Pandit Nehru, on May 27 and Kisan Ghat, the samadhi of Jat leader Chowdhry Charan Singh, on May 29. Hectic activities are on with invitation cards being printed and decorations, flowers, carpets etc being planned. The lists of invitees are being prepared. The Prime Minister and the President will attend the three functions. To sensitise elected representatives from Parliament to panchayats on issues concerning population and development, the Indian Association of Parliament on Population and Development (IAPPD) has developed a briefig kit which gives nuggets of information on issues like maternal health, maternal morbidity, infant and child health, missing girls, adolescence, AIDS, violence against women and ageing population. The ‘Advocay Briefing Kit,’ which was released by Prime Minister Manmohan Singh on Thursday, gives brief outlines of the National Population Policy, the National Health Policy, 10th Five Year Plan, the Reproductive and Child Health programmes, constitutional and legal rights of women and NRHM. It also provides conceptual understanding on linkages of population and development, population stabalisation and reasons for increasing population. The briefing kit is aimed at helping the elected representatives perform their roles of advocacy by providing them necessary information on issues concerning population and development. Principal of the Kendriya Vidyalaya, Khargone, who had accused the Collector of sexually harassing her, has moved the Central Administrative Tribunal (CAT) against her transfer to Bailadila in Bastar district of Chhattisgarh. Ms Shraddha Jha feels that she has been penalised for complaining against the indecent behaviour of the Khargone Collector, Mr S.K. Paul, and has been transferred to the remote corner of Chhattisgarh state under pressure. The Commissioner, Central Schools Organisation, New Delhi, the Assistant Commissioner, Central Schools Organisation, Bhopal, the Collector of Khargone and the Chief Secretary of Madhya Pradesh, have been made respondents in her petition. Ms Jha had complained to the authorities at various levels last month that the Collector had been making indecent advances towards her and harassing her. The Collector had, however, claimed at a press conference that Ms Jha was maligning her, as he did not agree to nominate Mr Shambhu Singh Gaur, a professor friend of Ms Jha, to a committee against the rules. Ms Jha had also complained against the Collector’s behaviour to the National Commission for Women (NCW). A member of the commission, Ms Anusuiya Uike, had told mediapersons in Bhopal earlier this month that Ms Shraddha Jha had been “wronged” and that the NCW had taken cognisance of the matter and sought reports from the state government and the State Commission for Women in this regard. A native of Jodhpur, Mahipal, left behind his land in search of creative pursuits and his search yielded results when he landed in Mumbai in 1942 and worked as a lyricist with director V Shantaram, according to his family. His career saw him changing over to the side of director Sohrab Modi and later to the Wadia Brothers. A poet at heart in real life too, he excelled in the role of ‘Diwakar’, the screen poet, in the all-time classic ‘Navrang’. Mahipal, the writer who is misunderstood by his pragmatic wife, played by actress Sandhya, and therefore takes refuge by escaping into a land of fantasy transforming the down-to-earth wife into a beautiful muse, captured the hearts of cinegoers. His creative angst which finds itself in the famous song ‘Tu Chhupi Hai Kahan Me Tadapta Yahan’ still remains one of the much appreciated film songs on the celluloid screen. However, it was his role in the Arabian Night fantasy, ‘Alibaba and 40 Thieves’ (1954) and in films like “Alladin and Magic Lamp” (1952) and ‘Alibaba ka Beta’ (1955) that made him popular even in Gulf countries. It was not only the Arabian night fantasies that Mahipal excelled in, but he also received offers to play several mythological characters alongside artistes like the late actress Nirupa Roy. His roles in films like “Sampurna Ramayan”, “Paras Mani” also earned him recognition. The Bench has been constituted by the acting Chief Justice of the Patna High Court, Mr Justice Nagendra Rai, through an administrative order, court sources said today. The Savarkar Utsav will include the display of photographs and books on him, a film based on Savarkar’s life, seminars and debates, and elocution, drawing, drama and dance competitions. However, the highlight of the event will be the rangoli competition. Participants will draw rangolis in an area of 5,555 square feet. The party has latched on to Savarkar especially after Union Petroleum Minister Mani Shankar Aiyar ordered the removal of a plaque on Savarkar from the Cellular Jail in the Andamans.